How do I set a page as my Home page? Setting a standard page in Shogun as the homepage for your store can be done with the click of a button. 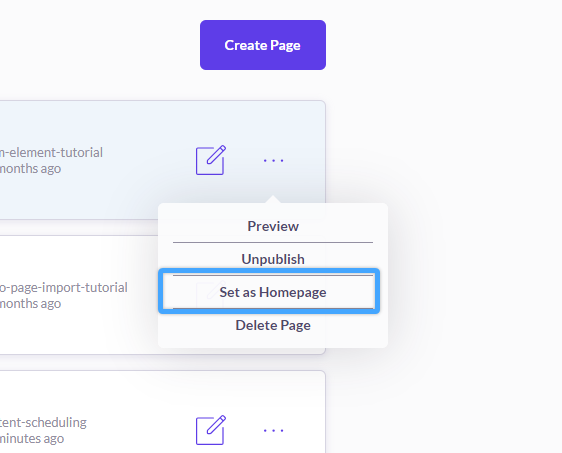 Making a standard page in Shogun as the homepage is as easy as the click of a button. Please ensure your homepage is published before following these steps. Click the three-dot button on one of your standard content pages in your Shogun dashboard. Select the "Set as Homepage" option. When editing a standard content page, click the three-dot button in the upper-right corner of the editor. Go to the Page Settings section and click the "Set as homepage" button.